American mainstays since the 19th century, .45-caliber rounds continue to be favorites for defensive use. We just might be at another one of those crossroads moments in history, a time when the choice of service firearms for both police and military is getting a lot of attention. The last major shift was in 1985, when the government decided to go with a 9 mm pistol designed abroad and made here. Much controversy surrounded this decision, but that is not the major concern in this column. I guess it’s sort of a historical retrospective on how John Law and G.I. Joe were armed. Because their armament almost always follows the military and police trends, armed civilians often use essentially the same firearms. This has not been all that bad a thing, since the last two centuries-plus in this American nation have had a remarkably peaceful character. Yeah, I know about the times when things got a bit out of hand, but it has worked well for the most part. Americans have long enjoyed their constitutionally guaranteed right to keep and bear arms, so common choices sometimes took on the character of traditions. One of the earliest traditions was a common handgun for the military services. Repeaters were obviously the choice, and the style of gun invented by Sam Colt was copied widely at home and abroad. Never before in American firearms history had the handgun ever taken on the importance it did in the Civil War. Large numbers of cavalrymen on both sides needed powerful revolvers and thousands of guns found their way into their holsters. When the war finally came to a blessed end, the metallic cartridge was available and proved to be the wave of the future. Army Ordnance Corps set about developing a cartridge-loading, large-bore, six-shot revolver. Needless to say, it was the Colt Single Action Army (SAA) revolver. My friend and accepted Western guns authority, Mike Venturino, has found original sources that describe the gun as “the new strap pistol” for the topstrap on the frame. What’s more important for our discussion is the first cartridge—it was where the .45 tradition came from. I can find very little in the way of hard data on why the size was selected, but the Ordnance guys came up with a round that threw a conical lead bullet a bit more than .45-inch in diameter. It weighed 230 grains and was called the .45 Colt cartridge. There were a number of differences between this .45 Colt and the one many of us have handloaded down for cowboy matches and up to magnum revolver performance. Since the Colt handgun used a manually operated rod to punch out fired rounds from the front, the case did not need to have a wide rim. Early .45 Colt guns and their ammunition worked well and began to build their reputation for superior terminal performance. It was a 230-grain bullet at around 800 fps. This proved to be effective as early as 1873. In 1875, Ordnance got hornswoggled into trying another revolver: the Smith & Wesson Schofield, which had a cylinder too short to take the long .45 Colt cartridge used in the Colt SAA. Several thousand of these break-tops were bought and went into service with the army. A .45 round which fit in the Smith & Wesson Schofield would also fit the longer Colt, but not the other way around, so the armories began to deliver a shorter .45 Colt for use in both guns. Performance was essentially the same—a 230-grain bullet at 800 fps. Both revolvers enjoyed good reputations, but eventually created enough problems that the Smith & Wesson Schofield was phased out. For most of the era of the Indian Wars and Western expansion, the country sent their soldiers in harm’s way with .45-caliber revolvers. The tradition was well-established and there was extensive civilian use in one form or the other. As the new century grew closer, we apparently decided to try newer cartridges. Several brands of revolvers chambered in .38 caliber seemed like a good idea, so they got a try. With cheaper ammo and more-easily managed recoil, they seemed OK—until the oft-quoted situation in the Philippine Islands. It’s much in vogue to denigrate tales that had the Moro swordsman of the Islands raising pure hell and caused the old Peacemakers to come out of storage to stop them. The situation may be over-stated, but the fact is that the old .45s were pulled out of storage and sent to our troops on the far edge of the Pacific. And it is likewise true that we began the development of a new semi-automatic pistol that led to the 1911. That didn’t happen until Ordnance bought several thousand Colt New Service revolvers in a slightly different version of the rimmed .45 Colt, another 230-grain cartridge capable of 800 to 850 fps. When the U.S. started issuing the new semi-auto pistols in 1911, we were working on nearly 40 years of using .45-caliber handguns that performed almost the same, at least downrange. Seven and a half decades later, we were doing the same thing. An icon of America, the classic M1911A1 was the service pistol and sometimes a police arm. One was in the hands of Special Agent Charles Winstead of the FBI when he led the team that took John Dillinger off the streets of Chicago. We used the .45 ACP cartridge for two world wars and several smaller ones. It was used in pistols and revolvers, as well as all typical Yankee submachine guns (M3, Reisling, Thompson) and even a little throwaway single-shot. Obviously, many manufacturers still produce pistols and revolvers for this cartridge and that it usually sells well in several formats. It will be around for many years to come. Also, there are more reasons than I can count why we need to move on, get modern, accommodate everyone and change. I just can’t see why a 230-grain .45 at 850 fps won’t work like it did 140 years ago. It is amazing to realize that the .45-caliber handgun is a unique American tradition. It will continue to be my primary fightin’ iron. That was a very interesting read. Thanks, my friend. 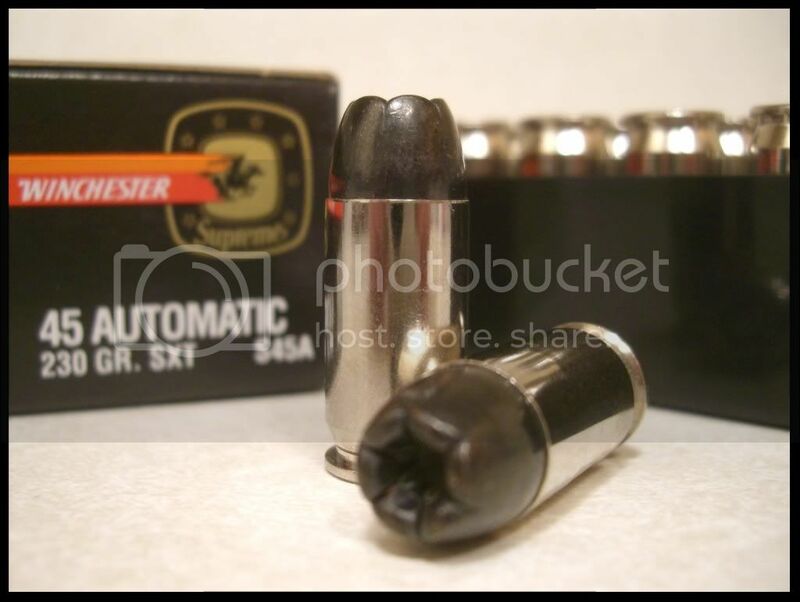 Isn't it funny that most .45 Colt loads are almost identical in ballistics to the .45 ACP? No, THANK YOU for contributing this. A very good read for anyone into cartridge and firearms history.